How ministry leaders can help older adults be a vital part of Christian community? With the explosion of the older adult population, this important book explores the opportunities and challenges that this presents for the Christian community. Amy Hanson challenges us to let go of many old stereotypes regarding aging and embrace a new paradigm that sees older adults as active, healthy and capable of making significant contributions. The author shows church leaders how they can unleash the power of the baby boomer population to strengthen their congregations. Amy Hanson, Ph.D., is a speaker, teacher, writer, and consultant who is passionate about motivating church leaders to engage older adults in significant Kingdom work. By the age of twenty-three, she led the active adult (fifty plus) ministries at Central Christian Church in Las Vegas. Today she unites her doctorate in gerontology and her ministry experience to educate and equip pastors, denominational leaders, students, health care professionals, and older adults on the unique oppor-tunities of an aging America. To learn more visit amyhanson.org. 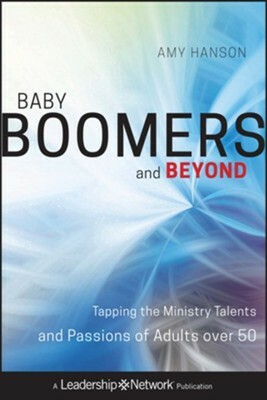 I'm the author/artist and I want to review Baby Boomers and Beyond: Tapping the Ministry Talents and Passions of Adults over 50 - eBook.